A new puppy can be a terrific addition to a family, but with the fun comes responsibility for its care and well-being. Consider and prepare for your puppy's needs before you adopt! Pick a puppy that is active, friendly, and inquisitive. Avoid the one that appears to be afraid of everything or snarls at people. If you select a timid puppy because you feel sorry for it, be aware that such puppies may be fearful throughout their life. Fearful dogs sometimes become aggressive and bite. Balance is the key, so look for a well-rounded animal. 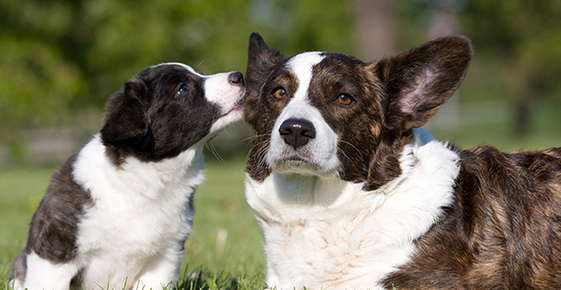 The temperament of a puppy's relatives may be an indication of its future behavior. If you are getting a puppy from a breeder, ask to see the dog's parents. Request the names of owners of related dogs. Contact these owners for information about their dogs' behavior and health patterns. A dog's training is an important factor in determining future behavior. Healthy puppies learn quickly. Frequent contact with people early in the puppy's life enhances its adjustment to the human family. Six to 10 weeks is considered an ideal age to acquaint a puppy with its new home. Do not engage in rough games with your new puppy; this may encourage aggression. If you decide on a puppy be prepared for several months of housebreaking and initial medical expenses. You don't have to get a puppy to train it the way you like. You can teach an old dog new tricks. For some families, the best choice is an older housebroken dog whose temperament, size, coat care, and behavior are established. When adopting or buying an adult dog, inquire about its background. Ask shelter personnel or the breeder what they have observed about its personality. Some animals are given to shelters because of behavioral problems. Many good dogs, however, are abandoned simply because their owners can no longer care for them or no longer want them. Sometimes, breeders will place an older dog in a home when its show or breeding days are over. Many people when moving give dogs away. These animals often make excellent companions. Providing a homeless animal with love and security can win you a loyal companion.